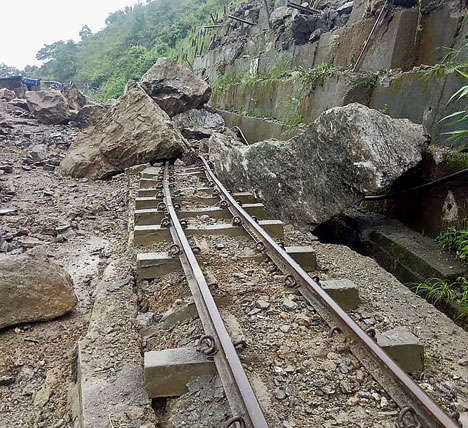 Siliguri: Toy Train services between New Jalpaiguri and Darjeeling will remain suspended for some more days as the tracks have been damaged in a landslide, Darjeeling Himalayan Railway sources said on Thursday. Vikas Arya, executive director (Efficiency and Research) at the Union railway ministry on Thursday visited Paglajhora in Darjeeling, the spot where the track has been damaged because of a landslide on August 1. "I have inspected the damaged DHR track. Our primary objective is to carry out repairs at the site and resume the service. We are keen in conserving the heritage railway. We are preparing a first-hand review report regarding the current state of affairs at the site and on how the matter can be resolved," Arya said. The railways have suspended Toy Train services between the hills and plains from August 2, after the landslide at Lower Paglajhora. The spot is located between Gayabari and Mahanadi stations, about 30km from Siliguri. Huge boulders are lying over the track and every day, new boulders are rolling down. About 60 metres of the track has got damaged, said railway sources. The toy train services between New Jalpaiguri and Darjeeling would be resumed only after necessary repairs and thorough assessment of the track's condition, DHR sources said. The railway official first visited the DHR loco shed at Tindharia, 35km from Siliguri, in a special train and then headed for the damaged site at Paglajhora. After the inspection, Arya headed for Darjeeling. He was accompanied by Parthapratim Roy, assistant divisional railway manager at the NFR, M.K. Narzary, the director of DHR and other railway officials from the NJP. "Our technical team is jointly working on the restoration with the state PWD (as NH55 runs parallel to the track) but frequent slides of boulders have made the repairing work difficult. Though we had plans to resume the service from the NJP on August 10, it seems that we have to extend the date," said a DHR official. Toy Train services between New Jalpaiguri and Darjeeling will remain suspended for some more days as the tracks have been damaged in a landslide, Darjeeling Himalayan Railway sources said on Thursday.